There are times when duplicate patient records are created, especially when patients provide different information during their visit. 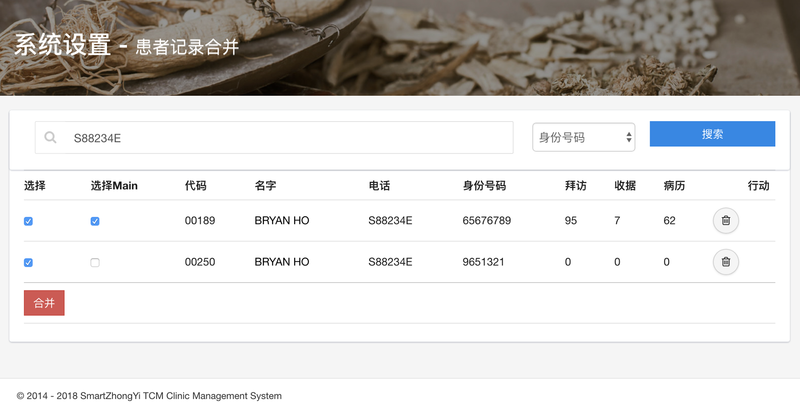 To overcome this, SmartZhongYi now has the Patient Record Merging feature for admin users to merge all the medical records, visits and receipts into a main patient record. After merging, the duplicate patient record can be deleted. Note: Does not merge the patient profile information (address, contact, occupation, etc). If your SmartZhongYi installation is on cloud or under maintenance contract, drop us an email at hello@smartzhongyi.com to request the latest version update.